The one-size-fits-all approach does not apply to work-spaces. 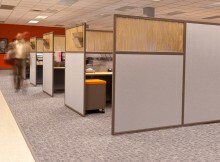 Every workplace has its own unique office design ideas, needs and requirements that standardized sizes often cannot accommodate. Modern offices vary in size and layout, and often the availability of furniture dictates the office design when it really should be the other way around. 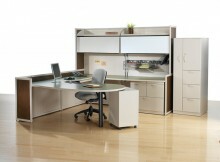 Offices should be designed to facilitate their primary function. That’s where Interior Concepts can help. We begin the design process with you, starting from your office’s specific size and layout, adding in your needs, along with our 20-year long design expertise, to create the perfect recipe for maximum office productivity. Better yet, all our furniture is manufactured in the United States, ensuring top notch quality standards as well as faster shipping times. Whether you need office furniture for private offices, collaborative conference rooms, high-density employee areas, reception spaces, or training classrooms, Interior Concepts can help you with your office design ideas. 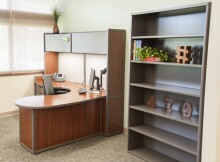 Our office design concepts begin and finish with you, as we cater to your specific office needs by the inch, reshaping our furniture to your specifications. Best of all, you can do all of this without even leaving your desk! With a phone and Internet connection, we can show you what your office can look like through a 3-D virtual tour. On top of that, you can make real-time changes to the 3-D design by conferencing with our designers. How convenient is that? Conceive, design, and set-up your dream office with just a few clicks, and be comforted knowing that we will be there with you through every step, offering our expertise in office furnishings.